The GIS Research & Map Collection (GRMC) provided copies of historic Indiana county atlases for the Ball State University Libraries’ Digital Media Repository. This new digital collection features 18 historic atlases with over 400 county, township, city and other maps dating from 1874-1921. The counties included in the collection are Benton, Carroll, Cass, Delaware, Elkhart, Franklin, Jay, La Porte, Montgomery, Ohio, Parke, Ripley, Rush, St. Joseph, Switzerland, and Vigo. Students of historic preservation, history, and archaeology often use maps from the atlases in their research and class projects. 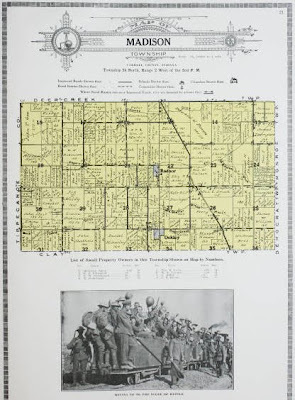 The historic atlases of Indiana are a valuable resource for anyone interested in the growth of Indiana and individual counties and cities in the late nineteenth and early twentieth century. Genealogists also find using this collection helpful in their search for relevant information about a historic place, and many of the historic atlases include biographies and illustrations of actual residents of the county, as well as illustrations of family farms, residences, and places of business. To access these complete records, click on the title page of the specific atlas and a complete listing of all pages will be provided. The GRMC also has historic atlases of other Indiana counties in its collection, including Henry, Putnam, Steuben, Union, and Wayne. The Illustrated Atlas of the State of Indiana, 1876, is another reference item in the GRMC. This atlas includes county, township, and city maps from the entire state, as well as colorful illustrations and text. The reference atlas collection in the GRMC also includes historic county, city, and state atlases from other areas of the country, including Iowa, Michigan, Illinois, Virginia, Maryland, Pennsylvania, Connecticut, and Massachusetts. Please contact the GRMC at 765/285-1097 for more information about these historic resources. For questions or assistance using the Digital Media Repository, please contact the Archives and Special Collections at 765/285-5078.